I like the quirkiness and sound of the Thinman OD, from the design to the hidden magic that it imparts on anything it touches. A definite winner when you need an in-your-face bass track or some lift on the good old guitar. 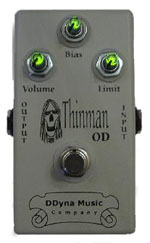 DDyna Music Co. describes the Thinman OD as a light overdrive based on the blending of 2 signal limiter types, suitable for various electric, acoustic or bass playing styles. BIAS: Bias limiter – clean blend to starved bias. LIMIT: Medium-hard limiter – clean to medium limit. The unit comes in with Neutrik 1/4 inch phone input and output female jacks, full bypass on/off switch. It can be powered via a 9V battery or a 9V AC adapter (not supplied). The battery is hard to get to as you need to unscrew 4 metal screw to get to the battery compartment and the 9V AC input pin/tip is not labeled so although the pedal has polarity protection you can fry it by applying higher voltage. In the case of the Thinman the tip is negative and the ring positive but it is not designated anywhere on the box. Not a biggie - but definitely something I'd prefer to see labelled. The pedal design is eccentric, by a face/skull looking graphic and the pedal name caption. The controls for Volume, Limit and Bias are bare pot knobs with a glued on black markers to designate the value you've dialed in. Quite ghastly on first sight until you power it up - they glow. Actually I find the effect cool but some people might be put off by the bare pot knobs instead of say quality metal knobs as used in some of the Marshall effect line for example. I found that the look of the pedal is "boutique" and I like the fact that when you put this thing in your pedalboard you're bound to get some stares. Since the brochure mentioned that the Thinman is an overdrive pedal I decided to test it on some tube amps first. I ran it through a Marshall JCM900 and an Orange Tiny Terror combo. In both cases the pedal added some clarity and overall leveling of the signal with some slight gain to the sound. It felt to me more as a compressor than an overdrive but it did bring up a lot of nuance in the playing and it was very pleasant. Moving the LIMIT pot too far to the right created a leveling effect as the sound didn't get louder, as in hard limiter. I found the best settings It did not force the amp into screaming overdrive as you'd expect from a traditional overdrive, so I think that the Thinman is better suited to function mainly as a compressor with a slight boost and maybe just a touch of hair of overdrive on the signal. Either way - the sound was very pleasant and it did add some more meat to the guitar (in this case Music Man Steve Morse). I tried the Thinman as a front end on a session where the band was going direct in the PC and using some amp modeling plugins. It did improve the signal levels and brought some more nuance into the sound that actually felt thin without it. I'd even venture to say that it imparted some tube-like quality to the signal chain. Long story short - all the guitars went through the Thinman OD first before hitting the recording chain. I also ran the Thinman on bass and this is where the magic really happened. I don't know exactly what this pedal does to the sound but the bass guitar was suddenly there, it mixed itself! I was really blown away by the sonic character the pedal imparted, especially on cheap bass guitars - making them suddenly into professional sounding instruments ten times their price! I even managed to get some mild distortion by running the "Volume" hotter at about 9 o'clock and the bass really stuck to the track like glue. I felt that the pedal imparted a compressor/limiter feel to the sound by boosting and evening it out and adding just a hair of overdrive to it. This pedal is a definite keeper when it comes to the lower end of the spectrum and will be my #1 go to pedal when recording bass guitars!